California Fire News - Breaking Fire News And Photos From California and around The World - Firefighting News Stories with a focus on delivering up to date California Fire incident news in a real fire line format, mixed with a hometown feel featuring local Firefighter related news articles and of course the inside scoop from sources all over the State of California. 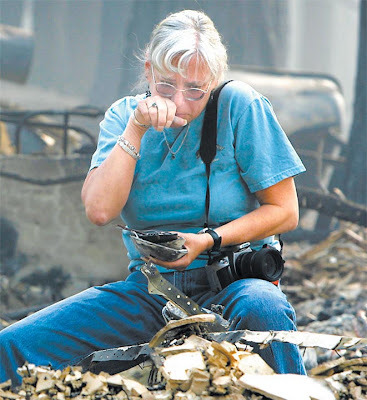 California Fire News finds the stunning photos, field reports, the hard facts delivered without embellishments. This is the RSS Feed you need on your desktop, laptop and your Blackberry also we have a new streaming podcast that has to be heard to be believed. Alpine, WY. Timber. Torching crown fire runs and spotting. M & M Complex (two fires), Eight miles south of Saratoga Springs, UT. Grass and brush. Running fire behavior. Laketown, UT. Grass and sage. No further information received. southwest of South Lake Tahoe, CA. Timber and grass. Light fire activity. Structures remain threatened. Voluntary evacuation continue. miles northwest of Rosamond, CA. Timber. Minimal fire activity. and timber. Last report unless significant activity occurs. litter. Isolated torching, smoldering and creeping. Mansfield, Coronado NF. Eight miles northwest of Patagonia, AZ. Chaparral. Cochise, AZ. Grass and brush. Double D, Taos Field Office, BLM. Fifteen miles northwest of Taos, NM. Ten, Gila NF. Twenty-eight miles southeast of Reserve, NM. Grass. private land 15 miles southeast of Ninilchik, AK. Grass and timber. fire with isolated short crown runs and torching. 36/ Andalusia-Palmetto, Florida DOF. Six miles north of Cape Coral, FL. Southern rough. Running and spotting. litter. Isolated interior runs and torching. relative humidity will move into the northwest quarter of the country. widespread showers and thunderstorms this weekend. STOCKTON - A team of four Stockton firefighters returning from the wildfire at Lake Tahoe crashed on Highway 50 when the brakes on their fire engine failed, officials said Friday. The captain, engineer and two firefighters were not injured. Stockton fire Capt. Michael Lilienthal said the group owed their lives to engineer Don Marlow, who was driving when the crash took place about 6:45 p.m. Thursday. "This easily could have been fatal for our firefighters," Lilienthal said. "You're talking a 35,000- or 40,000-pound engine." The fire engine was traveling about 50 mph on windy roads outside Strawberry when Marlow discovered the brakes did not work, Lilienthal said. Marlow purposely crashed the engine into a mountain to stop its momentum. An NBC news van was clipped by the engine, and a woman inside suffered minor injuries, Lilienthal said. The engine that crashed belongs to the state and was on loan to Stockton for major disasters. In exchange, Stockton firefighters respond to fires like the Angora Fire, which continued burning Friday. Marlow, Capt. 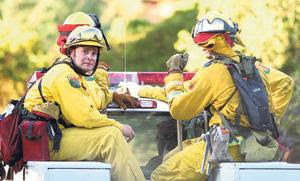 Brian Jones and firefighters Steven Thienes and Ryan Peters had worked the fire since Monday, Lilienthal said. Three other Stockton firefighters responded to the Angora Fire to lead strike teams, he said. Whether you evacuated during the fire or stayed throughout the Fire, the fire has changed conditions around your home and in the community. Please be especially careful in this new environment. Burned trees: Shallow roots systems have burned and standing dead trees (called snags) will be falling down, especially in high winds. Ash pits: White ash on the ground may indicate deep pockets of hot ash where roots and ground vegetation have burned and may be continuing to burn below ground level. Broken glass and sharp metal edges: When fire has burned through trash heaps, sheds, etc. glass is often broken and metal edges exposed. Children and pets should be carefully supervised to avoid these hazards. Hazardous smoke: Smoldering piles may include plastics or other materials that produce toxins in the smoke. Please avoid breathing direct smoke from smoldering areas. The orange retardant used to protect homes and resources is non-toxic and actually has a fertilizing agent. When re-wetted it becomes slick. It can be cleaned up with water, but may require a low-pressure spray or scrubbing on windows and vehicles. Sprinklers are important when fire is threatening your home. Winds from fire can carry embers for hundreds of yards and sometimes even miles when fire behavior is extreme. When evacuating during a fire, sprinklers can be left running in place on roofs and porches. 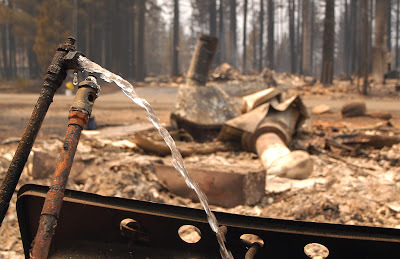 After the wildfire threat is over, the sprinklers can be removed or left in place for ash and dust mitigation. A RED FLAG WARNING REMAINS IN EFFECT UNTIL MIDNIGHT PDT SUNDAY NIGHT. FROM TODAY THROUGH SUNDAY EVENING...GUSTY NORTHWEST TO NORTH WINDS OF 15 TO 35 MPH WITH LOCAL GUSTS TO 50 MPH ARE EXPECTED NEAR THE INTERSTATE 5 CORRIDOR...WITH THE STRONGEST WINDS EXPECTED DURING THE NIGHTTIME AND EARLY MORNING HOURS. WIND SPEEDS ARE EXPECTED TO BE LESS FOR THE REMAINDER OF THE MOUNTAIN AREAS. IN ADDITION TO THE POTENTIAL FOR STRONG WINDS... THERE WILL BE VERY WARM AND DRY CONDITIONS THROUGH THE PERIOD. TEMPERATURES WILL CLIMB WELL INTO THE 80S AND 90S ACROSS ALL MOUNTAIN AREAS EACH DAY...WITH LONG DURATIONS OF HUMIDITIES IN THE SINGLE DIGITS AND TEENS ACROSS THE HIGHER ELEVATIONS. A RED FLAG WARNING MEANS THAT CRITICAL FIRE WEATHER CONDITIONS ARE EITHER OCCURRING NOW...OR WILL SHORTLY. A COMBINATION OF STRONG WINDS... LOW RELATIVE HUMIDITY... AND WARM TEMPERATURES WILL CREATE EXPLOSIVE FIRE GROWTH POTENTIAL. PLEASE ADVISE THE APPROPRIATE OFFICIALS OR FIRE CREWS IN THE FIELD OF THIS RED FLAG WARNING. Oilwell Road will continue to be closed during the day through Monday, and open in the evenings from 7:00 pm to 7:00 am, as suppression work and fire conditions allow. Everyone is encouraged to drive with care in this area due to the heavy traffic and hazards including firefighting equipment and falling trees. Traveling on roads during the day should be limited due to fire traffic. The road will open permanantly Monday evening at 7:00 pm. Beginning each evening at 10:00 pm, until 8:00 in the morning, the temporary flight restriction over the fire area will be lifted. Pilots may fly into and land in the Caribou Hills area. The TFR will go back into effect at 8:00 am. The TFR will be lifted during those hours, daily. Grass, brush, black spruce, beetle kill spruce, and some alpine. Smoldering and creeping fire behavior was observed today. Interior islands continued to torch periodically throughout the day. Some residents remained in the fire area today during the operational period. The Oilwell Road closure remains in effect between 0700 and 1900. Rehab was completed on the contingency line northwest of Caribou Lake. In Divisions P, A, and W crews at H-3 will continue to mop up 200 feet in from the perimeter and monitor green islands for spotting potential. Mop up will continue on the underslung line in Deep Creek drainage. Engines will continue to patrol and mop up any problem smokes. An excavator will start rehab on interior dozer lines in the Divisions. Crews in Division B will continue to assess and mop up 200 feet around cabins and in from the perimeter. A dozer and excavator will rehab unnecessary containment lines and repair roads as needed. 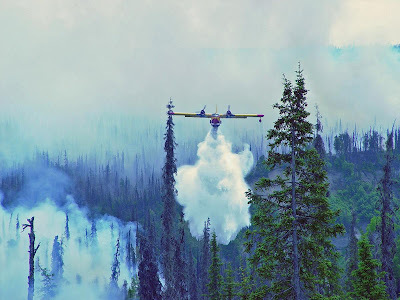 Cabin assessments and 200 foot mop up will continue in Division D. In Divisions F and I Chena will work north from H-80 to Kolomin Lake and south to the Division F/I Break. Equipment will work south from the F/I Break towards Jessie's Trail. Crews in Division M will continue to mop up 200 feet in from the perimeter between H-3.5 and H-4. Crews and overhead in Division J will relocate to Rocky Base Camp and the Division will be unstaffed thereafter. 12 hours: Fire spread is expected to be low due to the continued success of containment efforts. The potential still exists for some spread to the northeast in the Kenai NWR Wilderness Area. Lodgepole pine, alpine fir, engleman spruce. Fire behavior was active on the northwest side with sustained group torching and spotting. Relative humidities were low with hot and windy conditions. Continue focusing containment efforts with burn out operations on the southwest and west flanks. Mop up operations on the north and east flanks. Low relative humidities are expected for today and tomorrow. Winds are predicted to be out of the west on Saturday. Very likely to achieve target date. Saleen's Type 2 Incident Management Team assumed management of the fire at 6:00 a.m. Tuesday. Butte unit yesterday at approximately 1600 hrs? June 30, 2007 San Luis Obispo- Units from several fire agencies are fighting a fire behind the Cal Poly dorms. The fire started at about 8am Saturday. A spokesperson for Cal Fire says the fire has burned more than 120 acres. A line has been cut around 20% of the fire. Fire around 20 acres, ran to the top of the ridge. 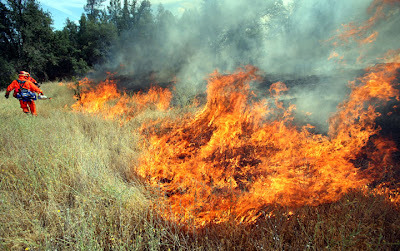 Burning in grass and brush, with potential to burn around structures. Appears mostly contained with one open flank that the tankers are hitting now. Air attack reported approx. 100 acres when they initially arrived on scene and has requested a total of 4 airtankers and 2 helo's. strike team of structure protection in addition to a strike team of type 3 engines on scene. Three additional type 3 engines just dispatched. Resources: 1 Air Attack, 4 air tankers, 2 helos, 10 type 3 engines, 2 s/t Local Gov engines, 1 s/t Dozers, 6 hand crews. Acres Burned: 3,100 acres; Full containment expected on July 3. West of South Lake Tahoe. Threatened: No additional homes threatened at this time. Evacuations: A limited re-entry schedule has been developed for the residence of the Tahoe Mountain area and portions of the Lake Tahoe Blvd. For more information on evacuations and re-entry call (530) 541-9205. 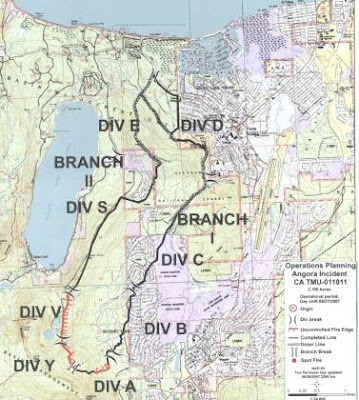 Cooperating Agencies: All fire agencies within the Tahoe Basin, USFS, CAL FIRE, CHP, South Lake Tahoe Police Department, El Dorado County Sheriffs Office, Red Cross, Civil Air Patrol. Conditions: The fire is burning in heavy timber and rugged terrain. The Highway 89 road closure has been lifted. Utility companies are restoring services within the fire area including power and gas lines. Crew safety remains a concern due to working in hazardous conditions including rolling material, snags and along roads where public and utility traffic has been reintroduced. [EDIS] Red flag warning in effect through sunday evening for the mountains of Santa Barbara. .A VERY WARM AND DRY AIR MASS WILL CONTINUE ACROSS INTERIOR SECTIONS OF SOUTHERN CALIFORNIA THROUGH THE WEEKEND. NORTHWEST FLOW WILL INCREASE ACROSS THE WARNING AREAS...RESULTING IN SUNDOWNER WIND CONDITIONS ACROSS THE PASSES AND CANYONS OF SOUTHERN SANTA BARBARA COUNTY DURING THE LATE AFTERNOON THROUGH NIGHTTIME HOURS TODAY THROUGH SUNDAY. THE GUSTY SUNDOWNER WIND WILL BRING THE POTENTIAL FOR WARMER AND DRIER CONDITIONS ALONG WIND EXPOSED PORTIONS OF THE SANTA BARBARA SOUTH COAST. THE NORTHWEST FLOW WILL ALSO BRING GUSTY WINDS TO THE INTERSTATE 5 CORRIDOR DURING THIS PERIOD...WITH CONTINUED LOW HUMIDITIES ACROSS HIGHER ELEVATIONS OF THE LOS ANGELES AND VENTURA COUNTY MOUNTAINS. ...RED FLAG WARNING REMAINS IN EFFECT UNTIL MIDNIGHT PDT SUNDAY NIGHT FOR GUSTY WINDS AND LOW RELATIVE HUMIDITY... A RED FLAG WARNING REMAINS IN EFFECT UNTIL MIDNIGHT PDT SUNDAY NIGHT. FROM TODAY THROUGH SUNDAY EVENING...GUSTY NORTHWEST TO NORTH WINDS 15 TO 35 MPH WITH LOCAL GUSTS TO 45 MPH ARE EXPECTED THROUGH THE PASSES AND CANYONS OF SOUTHERN SANTA BARBARA COUNTY...WITH THE STRONGEST WINDS DURING THE NIGHTTIME THROUGH EARLY MORNING HOURS. IN ADDITION TO THE GUSTY WINDS...THERE WILL BE VERY WARM AND DRY CONDITIONS ACROSS MUCH OF THE MOUNTAIN AREAS THROUGH THE PERIOD...WITH A LONG DURATION OF HUMIDITIES IN THE TEENS...AND SINGLE DIGITS...LIKELY. THE WARMEST TEMPERATURES ARE EXPECTED TO OCCUR IN THE FOOTHILLS OF THE SANTA YNEZ RANGE... WHERE TEMPERATURES COULD SOAR TO AROUND 90 DEGREES EACH DAY. 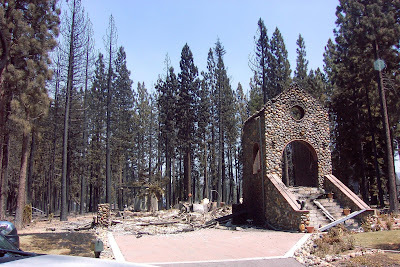 Today's Date: Friday, June 29, 2007, 9:00 a.m.
Start Date : June 24, 2007, 2:00 p.m.
Fire behavior has greatly diminished but the potential for problems still exist. Isolated interior single tree torching may be likely throughout the day. Today's expected winds are southwest 5 mph with gusts up to 14 mph will decrease to 2-5 mph. Temperatures are expected to be 77-80 slightly higher than yesterday. Humidity is expected to be 14-18 % down slightly lower than yesterday. Crews will continue perimeter control operations to threatened communities. Line improvement and mop up activities will continue to be completed 300 feet interior of the line and snags will felled 500 feet interior of the line. Evacuations remain in effect for the Fallen Leaf Lake area. 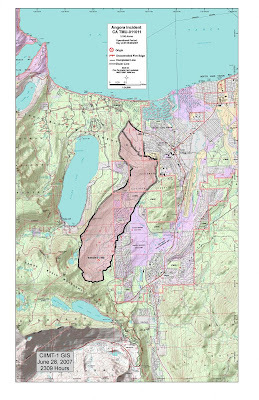 Voluntary evacuations remain in effect for portions of South Lake Tahoe community. Fire restrictions are in effect outside of fee campgrounds: No open fires or charcoal barbeques, propane only is allowed with a 2007 fire permit. No Fireworks allowed in any area. Public meeting is scheduled for tonight at the South Lake Tahoe Middle School at 8pm. "THE NATIONAL WEATHER SERVICE IN LOS ANGELES/OXNARD HAS ISSUED A WIND ADVISORY...WHICH IS IN EFFECT UNTIL 3 AM PDT SATURDAY. AREAS OF NORTHWEST TO NORTH WINDS 25 TO 35 MPH WITH GUSTS OVER 45 MPH WILL AFFECT PARTS OF THE SOUTH COAST OF SANTA BARBARA COUNTY THROUGH AM PDT SATURDAY...THEN WINDS WILL BEGIN TO DIMINISH. WINDS WILL BE STRONGEST BELOW PASSES AND CANYONS. A WIND ADVISORY MEANS THAT WINDS OF 35 MPH OR GREATER ARE EXPECTED. WINDS THIS STRONG CAN MAKE DRIVING DIFFICULT...ESPECIALLY FOR HIGH PROFILE VEHICLES. USE EXTRA CAUTION. Affected Counties: Monterey, Santa Barbara, Kings, San Bernardino, Kern, Ventura, San Luis Obispo, Orange, Los Angeles"
EDITOR: Found this photo on the web at Webshots. Acres Burned: 3,100 acres; Full containment expected on July 3, 2007. Threatened: 300 homes, 45 commercial properties and 70 outbuildings. A Red Flag Alert will remain in effect until 9:00 pm this evening. A wildfire that threatened close to 100 homes in a subdivision between Clear Creek and Texas Springs roads was half contained at 6 p.m. today. Full containment of the 200-acre Creek Fire is expected at midnight, said Doug Wenham, a state Department of Forestry and Fire Protection spokesman. While the closure of Texas Springs Road was lifted about 5:30 p.m., he said, an evacuation order for neighborhoods south of the road was expected to remain in effect until 8 p.m.
Because of heavy equipment and firefighters on the roadway, Wenham said, Clear Creek Road probably will be closed throughout the night between Honeybee Road and Cloverdale Road." CAL FIRE NEWS EDITOR: InciWeb pulled the map from public access I posted and commented on in a earlier post? Which is very ironic! at the time I posted the original map I commented that I was amazed that they were releasing such high quality working fire perimeter maps to the general public basically the same map as used in the ICP, and 209 showing divisions, dozers lines, containment, etc. Well the map got pulled shortly thereafter and when this editor inquired with a very nice Inciweb person she explained that they were worried that such a map would confuse the public! Oh us poor public when will we ever be trusted to read a map properly! But the InciWeb person has been very nice and cooperative and has attempted to send me the map three times by e-mail but the file seems to be broken? What was on that map anyhow? And the very nice lady wants me to believe that the federal government computers cannot possibly send such a large file as the original picture that had been posted? eh ok..
Now they have reposted a modified map that has been redone removing those confusing things like Divisions! and it is of much poorer quality and almost unreadable size. Well whatever the reason we love InciWeb and very nice people work there. The new one is here. Any firefighters on the line and off send your ICP map photos, Pictures, Scoops, Green sheets, Announcements, Crew links e-mail to this link CAL FIRE NEWS and we will get them up here. Information is always a good thing! The original was not saved by this editor but a smaller version at the original post is here. UPDATE: InciWeb came through and have sent me the file! Kristi at InciWeb rocks! 'Angora Incident, 3100 acres and 70 percent containment. Active demobilization of excess resouces will continue, with large scale demobilization during the next operational period. Residents will be permitted to remain only 1 hour following their arrival during the permitted entry period. Residents will be permitted to remain only during the permitted period. Residents must show proof of address and identification. Residents are restricted to their own address only. Violators will be subject to trespassing charges. Residents should use extreme caution as many hazards still exist. Residents enter at their own risk. Insurance adjustors will be permitted with resident. This plan is subject to changing conditions. Please check the hot line prior to coming to a check point. 4 acres and 2 outbuildings. Fire at the base of the cuesta grade, 3-4 acres with moderate potential. Being hit hard with air resources. SHU dispatching large amount resources to fire on Clear Creek Rd. 5+ acres mod to rapid rate of spread. Position 40.29.7 N by 122.27. Resource request for four water tenders, 3 additional AT's and 1 copter. A fire of unknown origin roared to life in the hills above Franz Valley School Road Monday, burning more than 45 acres, threatening few structures and rattling lots of nerves. Crews were expected to have the fire fully contained by Wednesday morning. Late Monday, fire crews from several departments battled a brush fire west of Calistoga that, as of late Tuesday, had consumed more than 45 acres. Although the skies above Franz Valley School Road were clear by Tuesday afternoon, the blaze wasn’t dead, nor fully contained, according to Knights Valley Volunteer Fire Department firefighter Bud Pochini. The fire began about 5:15 p.m. on Mountain Home Ranch Road near Petrified Forest Road, quickly burning about 20 acres, but by 9 p.m., the blaze had swallowed 35 acres, according to Tony Moriani from CalFire. Ironically, Pochini said, the Knights Valley firefighters would have had to protect the home of one of its own had the wind shifted easterly. That scenario never happened. At least one home was threatened, Pochini said. When fire crews break into homes to save them they focus on taking curtains from the windows and removing furniture from the walls closest to where they anticipate the fire will engage the home. They’ll also pull back any carpeting. “The reason for that is that temperatures inside the house closest to the fire can get so hot the curtains, furniture and carpeting will spontaneously combust and the whole house could be lost,” he said. There was another factor that threatened that home. As the fire burned in timberlands, California Highway Patrol crews blocked off access to Petrified Forest and Franz Valley School roads, Moriani said, but there were no calls for voluntary evacuations of any residents in the area. Numerous units from CalFire, Napa County Fire and Sonoma County fire agencies responded to the fire, including 13 engines, three bulldozers and four water tenders. By 8 p.m. Napa County Fire crews stationed at the Big Tree Road station on Highway 128 were reporting the fire had expanded to between 30-40 acres at this time. By 9 p.m. Monday the night of the fire, Moriani said, there was no indication of what caused the fire.